Can this iOS-friendly pad controller find its groove? Should you be tapping an iRig Pads rather than a touchscreen? IK Multimedia was always going to get there eventually: it's finally built an MPC-style (are we allowed to start calling them 'Maschine-style' yet?) pad controller aimed at iPad/iPhone/iPod touch musicians, but also fully compatible with Mac, PC and Android. 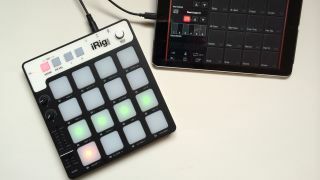 The iRig Pads comprises 16 two-colour backlit pads (red and green, but mixable to orange, too), two knobs, a fader, two buttons and a push-button rotary encoder, all of which can be assigned to output a range of MIDI data. The build quality of the all-plastic casing is in line with the rest of the iRig series, which is to say it's solid enough, but you wouldn't want to drop it too far onto a hard surface, and it exhibits a degree of 'creak factor'. Importantly, the pads feel solidly seated and are nicely playable, and the whole thing is certainly portable at 190 x 205 x 23mm and 547g. Also in the box are cables for hooking it up to both Lightning and 30-pin Dock Connector-equipped iOS devices, and a USB cable for Mac and PC. The iOS cables plug into a mini-DIN connector on the unit, while the other hooks up via a microUSB port; all three carry power to the Pads from the connected phone, tablet or computer, and there's also a 1/4-inch jack socket on the back for hooking up a MIDI pedal. The iRig Pads has two operational modes: Externally Controlled and User/Programmable. Externally Controlled hands governance over to a host application, which can then presumably be used to configure the unit. IK tells us that it's working on deep iRig Pads integration for its SampleTank and GrooveMaker apps, which will presumably take advantage of EC mode, but right now no such app exists. User mode it is, then, which has the iRig Pads operating much like any other MIDI controller, the pads, knobs, fader and buttons sending out MIDI note, CC and Program Change messages. Assigning these is done using the pads themselves in Edit mode (hence the function labels next to each one). Pads can be set to latch (Toggle) mode, as well as standard 'Temporary' mode, and every control can allegedly be set to output on separate MIDI channels - although that wouldn't come up as an option on our preview unit. There's also a Fixed Velocity button for setting all pads to output at 100 velocity, no matter how hard they're struck. "IK tells us that it's working on deep iRig Pads integration for its SampleTank and GrooveMaker apps." The pads light up to give visual feedback while editing, but an alphanumeric display of some sort would obviously make the process a lot more intuitive. The iRig Pads is by no means difficult to program, though, and its unapologetically old-school approach can actually be quite fun once you get used to it. With your setup complete, you can save it as a Scene, of which the iRig Pads can store up to 16 at a time. The manual lists six factory preset Scenes (GM drums, chromatic and four Akai MPC banks), but the preview model was missing the chromatic one. The biggest question hanging over the iRig Pads is, what, if anything, will become of that Externally Controlled mode? There aren't that many drum pad-orientated apps on the App Store that actually let you assign MIDI controllers (although, notably, one that does is Akai's very capable iMPC Pro, which was incorrectly mapped in one of the preset MPC Scenes we had), so it is pretty important that something happens in this department. On the more immediate down side, the lack of external powering could be an issue for some, as could the occasional failure to power up first time when plugged into an iOS device. And we assume the odd minor glitches we came across (missing and broken preset Scenes, and broken per-control MIDI Channel assignment) are down to unfinished firmware, but be aware of them nonetheless. The iRig Pads is out today, priced at £119/$150.